Samsung’s Note 8, due to be unveiled in a month, will burst through the $1,000 (c. £920) price point, and may well become the first mass market phone in that price bracket in the UK. It’s also likely to be a monster, with a 6.3 inch diagonal display. Analysts have tipped Apple to reach this price point with the next iPhone; it’s close enough already, with the most expensive current iPhone is the 256GB iPhone 7 Plus costing $969 (£879.00 in the UK) SIM-free. Three new iPhones are rumoured, with “iterative” updates to the 4.7 inch and 5.5 inch form factors, plus an all-singing, all-dancing model: a bezel-less OLED model, with proprietary wireless charging and face recognition, which may or may not have an in-screen fingerprint reader. The latter may start at $1,200 with heftier configurations costing $1,400. Earlier this month Bank of America Merrill Lynch lowered its projections for iPhone sales this year, based on insider information that supplies of this super-iPhone were constrained. In line with previous reports, Apple is struggling to incorporate advanced fingerprint and 3d sensors into the device. 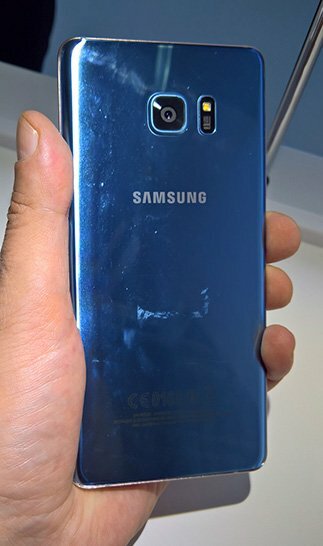 Samsung tried and failed to incorporate an under-glass fingerprint sensor into the Galaxy S8, resulting in the awkward placement of a conventional fingerprint reader right next to the camera lens, as we found. After becoming a cultural icon for all the wrong reasons, Samsung decided to retain the Note brand. It even recycled the parts for an FE (“Fried Ears”) edition. Renders of the finished Note 8 created by case maker Ghostek again point to an awkwardly placed fingerprint sensor - even more so given the size of the 6.3 inch diagonal display. Expect the superfluous Bixby button, which Samsung is determined that you don’t use for anything else. It has been updating the software to kill third party hacks which allow you to reprogram the button for other purposes. That reflects Samsung’s view of your “cognitive tolerance” - rather like A Clockwork Orange, the pain is deliberate, so you don’t go back to your bad old ways. You must learn to love your helpful AI assistant.